Behold: an incoherent and incomplete pile of things that collectively will be useful things for me on our trip to Brazil here in a few days. And so it remains there as a pile until I find some decent time to pack and gather everything else. This has been a hard week so far! Work schedule has been crazy and other post-work obligations have been demanding as well. And thus, I’ll probably get to this, oh ya know….Friday. the day where we finally gather everyone together to start our pre-WYD retreat. 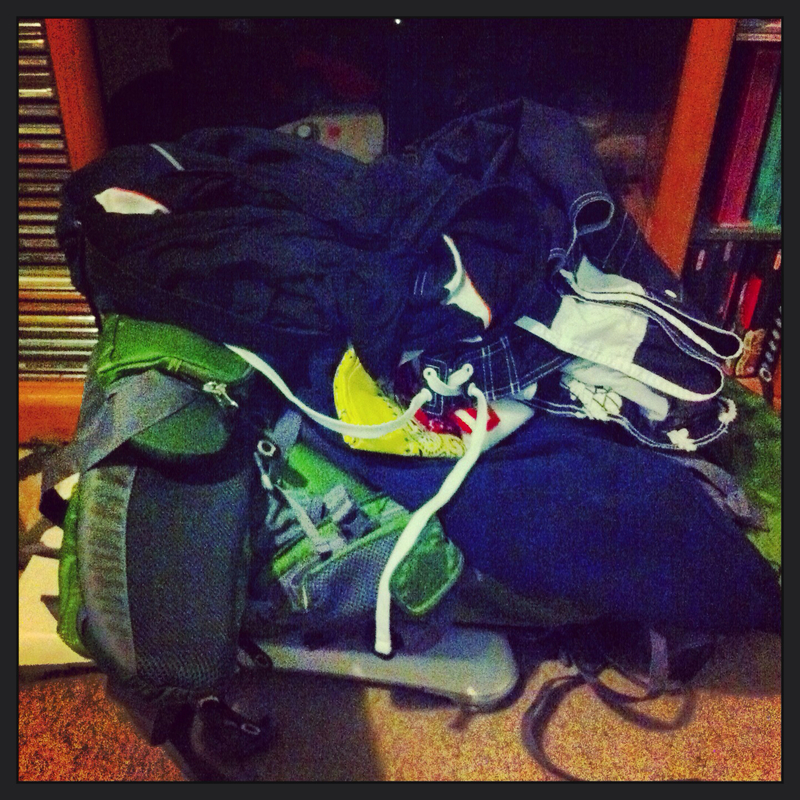 Thank goodness I took off work on Friday so I can concentrate on…packing! Haha. But! This is not to say that I haven’t done any sort of preparation whatsoever! A few weekends ago, I helped collect prayer intentions from fellow parishioners so that we can take those intentions to pray for while we’re at World Youth Day. We were out there in the heat after Masses for two weekends and collected quite the handful, which is fantastic! What sticks out to me the most is the absolute gratitude that some parishioners expressed in us collecting these intentions, and I can’t wait to start praying for those! On my own Facebook/Twitter, I also asked for intentions. I let it slip to one of my coworkers that I’m going to World Youth Day and offered to take any of her prayer intentions, but she came back around and personally talked to a bunch of people in the office and asked for their intentions. How cool! On the spiritual side of things, I made my Act of Total Consecration to Mary yesterday on the Feast of Our Lady of Mt. Carmel at a Carmelite monastery of Carmelite discalced nuns. No big deal. I know that making the Act of Total Consecration is something all of us St. Thomas Aquinas/SEAS pilgrims are doing so that the Act can be made during the trip, but a few of us decided to start early so that our Consecration could be made on a feast day (since no Marian feast days occur during World Youth Day). I kept a near-daily “journal” of my spiritual journey and preparation for the Total Consecration via my blog. So yeah, I’ve been doing work. But…maybe not immediately practical, tangible work. Spiritual work, yes. But I can’t pray my backpack into packing itself. I’ll keep this short because [I originally wrote this at 11PM], and I still [had] a full workday tomorrow. More updates to come!